Although they are members of the insect family, and carry the same characteristics of other insects, butterflies generally appeal to people because of their unique characteristics. Butterflies comprise the true butterflies (superfamily Papilionoidea), the skippers (superfamily Hesperioidea) and the moth-butterflies (superfamily Hedyloidea). All the many other families within the Lepidoptera are referred to as moths. 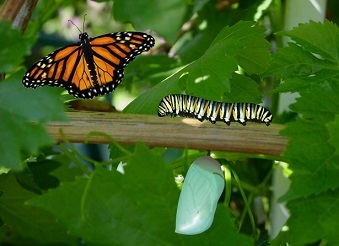 The time length of the development cycle of the butterfly varies from species to species and from climate to climate. There are more than 150,000 species recognized however, most of these are of the moth variety.